Please bring instruments and other equipment when coming to the studio. Please send to the engineer, before the day of recording - a list of instruments and equipments that will be brought, to ensure there will be enough space, etc. Please take into consideration the recording studio is on the second floor of the building and that width of the stairwell is 120 cm, hence please make preparations for more people to move equipment if needed. After all equipment and instrument settings have been completed, the engineer’s job begins. Each instrument will have a microphone. In the case of recording one drum set, bass, and guitar at the same time, 12-15 tracks will be required. After the microphones have all been set, the next step is sound check. The engineer will find and set the optimal settings for recordings. 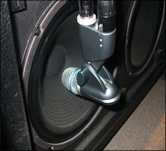 Adjustments must be made for each microphone’s type, position, distance, and angle to the instrument, the drum’s pitch, along with the bass and guitar amps. After this is done, trial recordings are done with band members to double check the sounds. The real work begins. 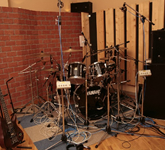 The picture shows that the simultaneous recording of a drum set, bass, and guitar. Individual recording of each instrument is also possible. The studio is comprised of three booths, hence recording 3 different parts at once is possible without hiding the sound. This is especially convenient for band members who often check other band members to stay in sync. 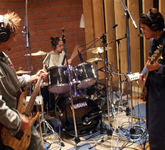 Once the band is satisfied with the basic recording, the adjustment of each part begins. As the studio employs a professional engineer, even one small note may be adjusted. 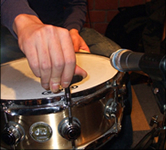 However in the case of drums, good live drumming technique is also required. After basic post recording adjustments, the overdubbing of other parts is then done. The tone of the guitar solo, keyboard, horn section, etc. will be gradually “layered”. Once all recording for the instruments has been completed, the vocals and chorus will be recorded. Once again, following Step 3, the microphone type, position, distance, and angle will be decided. 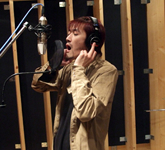 Furthermore, adjustment of the cue box is important to ensure smooth vocal recording. After all recording has been done and completed; then comes the time for the engineer to shine. Based upon the band’s comments and directions, the engineer will adjust each track’s effects and equalizer settings.The balance of each song will be checked in a detailed manner. The approximate time to mix down only one track may take at least 2 hours. During the mix-down, aside from certain times, all members will be asked to leave the room; as band members get new ideas and opinions during this time, the original image of the song may often be forgotten and the original desired sound may not be possible. 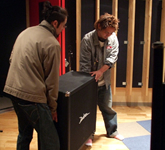 Once the band’s comments have been received, and the mix down has been completed, the product is given to the band to check the sound. 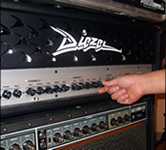 The band’s first impression of the image of the sound is important. For those not experienced with recording, they may become confused as they may not know the sound they want after listening to the song many times. 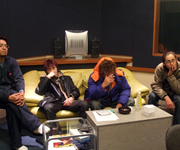 After listening to the song and the band’s comments are received, these comments are once again used to do the final adjustments to the mix. In regards to recording simultaneously as a band or individually recording each instrument, there is no “correct” way. Both cases are common. For those who wish to record simultaneously, they may do so because it may be easier for the band to stay in sync for complex timings. In the case of individual recording of each instrument, band members may find it easier using a metronome during a recording to stay in sync. Furthermore in the case of songs that are arranged to only have vocals or guitar at one part, the drummer may change the timing based on the drummer’s own perception, thus when this happens all other members must also try to come in sync with the drummer and this may take a long time to correct. 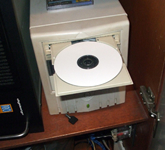 To prevent or to lessen the number of times this occurs, multiple recordings may be done to ensure a good recording. 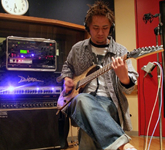 In addition, recording time is NOT rehearsal time. Due to the high prices being paid to record in a studio, please do not use studio time to practice. For example, songs that may be written and finished the day before, may require a band to do more than 10 takes and still be unable to make a satisfactory recording. Each band member’s level and understanding of the arrangement and sound of each song should be the same. ☆I want more attack in the bass drum. ：　Really step into it when recording! ☆Please make the snare strikes uniform. ：　Please practice on getting the same sound. ☆The high hat is too loud, please lower the volume. 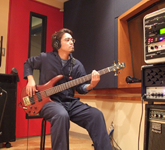 ☆The bass guitar’s contours and notes are not clear. ：　Please practice stronger striking and picking on the bass strings. ：　Record with a Les Paul instead. ：　Find a better vocalist! Most of the above problems maybe solved if given the right time and budget, however these are complex issues. Basically, the sound that each band member makes will be the sound that is recorded. If a band expects to sound like the “best major label band out there”, the band will have to be able to play and produce a sound that is similar or the same as the “best major label band out there”. If there are any issues in regards to the sound or recording, please do not hesitate to ask the engineer. Even the most trivial questions will be answered. “ProTools” recording software is used for the mix-down and practically anything may be done, however the basic sound is dependent upon the artist’s arrangements. As the recording process is much easier once the artist is on the same page as the engineer, please do not ever hesitate to ask any questions beforehand.